Shänna Tennyson and I had an inspirational afternoon touring member business Seeking Health, a local manufacturer and distributor of high-quality dietary supplements. 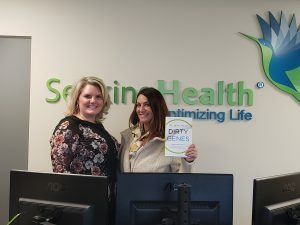 Karyn Shaffer (of Seeking Health) and the Chamber’s Shänna Tennyson pose with Dr. Lynch’s book during our tour of Seeking Health. I knew that they make supplements and that their president, Dr. Ben Lynch, is the foremost expert on methylation and nutrigenomics but Shänna and I had no idea how amazing their corporate culture is. Seeking Health CEO Adam Rustad gave us a tour of the facilities which included a gym, standing desks and metal prints of Peter James’ photography throughout the facility. Their corporate culture encourages a healthy diet and exercise so employees are their most productive and healthy. The emphasis on health includes in-office yoga in the gym and a personal trainer that comes to the office twice per week. Rustad trusts the 20 employees to do their jobs and make good decisions. He doesn’t feel the need to even have Outlook on his phone. When he arrives home every evening and clicks the garage door opener, he slides into family mode and leaves work behind. They encourage that at Seeking Health. Employees who don’t take work home with them are less likely to burn out and are happier, healthier and more efficient. Rustad also shared their commitment to investing in their employees. Seeking Health employees go through motivational training. Last year, they went through the 7 Habits of Highly Effective People. This year they are participating in Brendon Burchard’s High Performance Habits. This highly successful, local company also has a huge heart. They give 1% of their profits to local nonprofits, and they decide which nonprofits get donations in a really fun way. They play Family Feud in their gym. The winner gets to choose which local nonprofit their prize money ($250-$1,000) will go to. They also start their morning staff meetings by telling jokes and they try to keep the morning meetings to 6-8 minutes. In a company whose focus is e-commerce, their perspective is unique. They aren’t concentrating on dollars, they focus on the “lives” they’ve changed. As Steven Covey says: “do the right thing for the right reasons at the right time is the key to quality of life.” It’s no wonder why Seeking Health employees are so proud of their company.